Need stuff? Need housewares? Or are you a housewares collector? Bookmans has a Gallery section which is filled with much more than just ordinary stuff. Our buyers choose only the most unique and unusual items to feature on our sales floors. These items run the entire spectrum of tastes and utility. We have everything from original artwork and pottery from Mata Ortiz and other artists. We feature kitchenwares both modern and vintage, tools, glassware and glass art and Native American works. Our shelves are full of African masks and carvings, textiles, unusual lamps, collectable dolls, utility knives and decorative swords and an endless variety of handmade items from artists around Tucson and Arizona. That isn’t even taking our Geek Zone into consideration – where we have Geek Out treasures galore. This section includes action figures, Pop figures, Star Wars and Star Trek memorabilia and all things relating to modern and vintage comic characters. We don’t want to leave out our Whovians who can grab posters, tees, sonic screwdrivers, Tardis and adorable Daleks. When looking for that perfect addition to your Housewares Collection, let’s start our shopping trip with a Tee Pee night light. From First American Enterprises, this handcrafted, hand painted nightlight is a replica of a traditional American Indian dwelling. The word “Tee Pee” originated from the words “Ti” meaning swelling and “Pi” meaning used-for. It serves as a decorative piece but is also fully functional, giving off a warm light for night. Next is an amazingly large painted paper eagle with salmon kite which can be converted into a wall hanging. It’s wing span is approximately 6ft. and is an impressive addition to any space. For our ladies with a love of vintage we currently have two box pocket books that are spectacularly adorned. Both are Bakelite with highly detailed decorations. The first is an Annie Laurie Original, fully lined and features raised fully articulated bird and flower decoupages. The second is fully lined with moss green velvet, featuring a quaint interior mirror and has breathtaking city scenes laid on it’s surface. The detail is amazing and words “Den Haag 1741” can be glimpsed in the corner. These are both treasures of the highest order and one of a kind pieces. Next we move into the more functional, yet no less appealing, items. Bookmans regularly features both functional yet aesthetic items for the home. Here we have a 3-piece Turi-Design Lotte hand-painted “Wescreen” serving set made in Norway. Painted on the dishes are jovial couples in festive regalia attended by birds and flowers. Also with a vintage feel but not less modern in use is a Lynns stoneware multi-color mixing bowl set. Onenida has always been known for tradition and quality, and is featured by the large stainless steel turkey/roasting pan currently on our sales floor. For glass and stemware the choices are endless, as we have both in every color of the rainbow including a stunning deep blue 4piece wine glass set. How would you like an original vintage phone or a Taj Mahal bird cage? Maybe a bright orange juice bottle or a variety of sizes, colors and prints decorating your dinner plates? No one can resist a vintage print of an old-time typewriter for their walls, even accompanied by the genuine article – an actual vintage typewriter that actually works. How about a Four Horsemen candle holder or a Super Stud Rock? The best thing is that you never know what you will find on our sales floor, maybe even an actual pair of leather Lederhosen?? We currently have two pairs, one for you and one for your best friend. 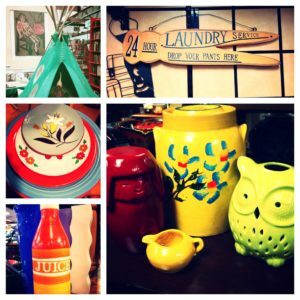 Bring in your used items and get Trade Credit to purchase these irresistible treasures (or of course, pay with cash). If you are especially crafty, bring in your hand-made items for us to check out too. Have fun and remember that it will always be original when it comes to your finds at all of our Bookmans locations. To see more items available at our Bookmans Speedway location take a look at Haute Housewares on our FLCKR site.